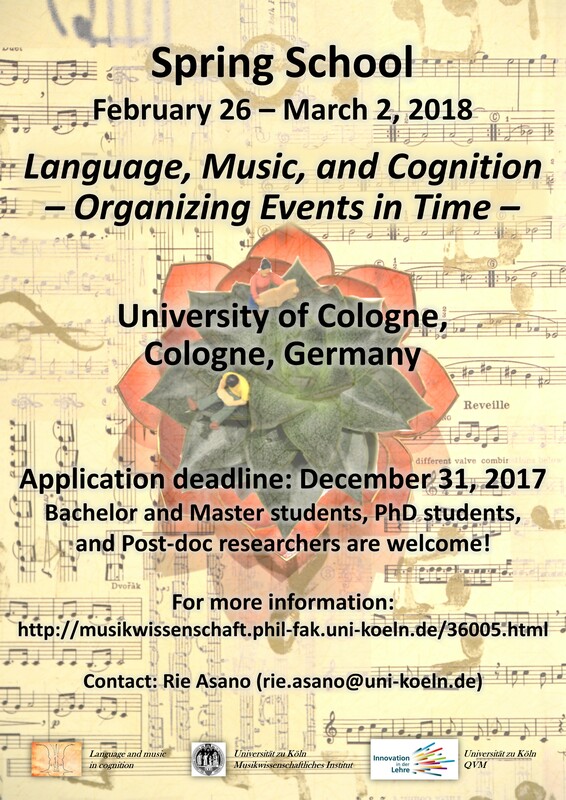 We are happy to announce our spring school of “Language, Music, and Cognition” taking place in Cologne, Germany, from February 26th to March 2nd, 2018. If you wish to participate in this spring school, please apply till December 31st, 2017. For more details, please visit our homepage (http://musikwissenschaft.phil-fak.uni-koeln.de/36005.html?&L=1). “Language, Music, and Cognition” is an international spring school held from February 26th to March 2nd, 2018 at University of Cologne, Cologne, Germany. Participation to the spring school is free of charge. If you are interested in participating in this spring school, please submit your application (motivation letter and CV) till December 31st, 2017. This spring school provides lectures given by experts in the respective research areas including biology, psychology, neuroscience, musicology, linguistics, and computer science. Along with the lectures, there will be group work sessions and a poster session. Applicants are invited to contribute their own work to the poster session. The abstract of the poster can be also submitted via application form till December 31st, 2017. This entry was posted in All events, Call for papers, MusiCoLinguistics-News, News by rie.asano@musicolinguistics.de. Bookmark the permalink.